For posts related to David Tennant in the Press on Blogger.com click here. 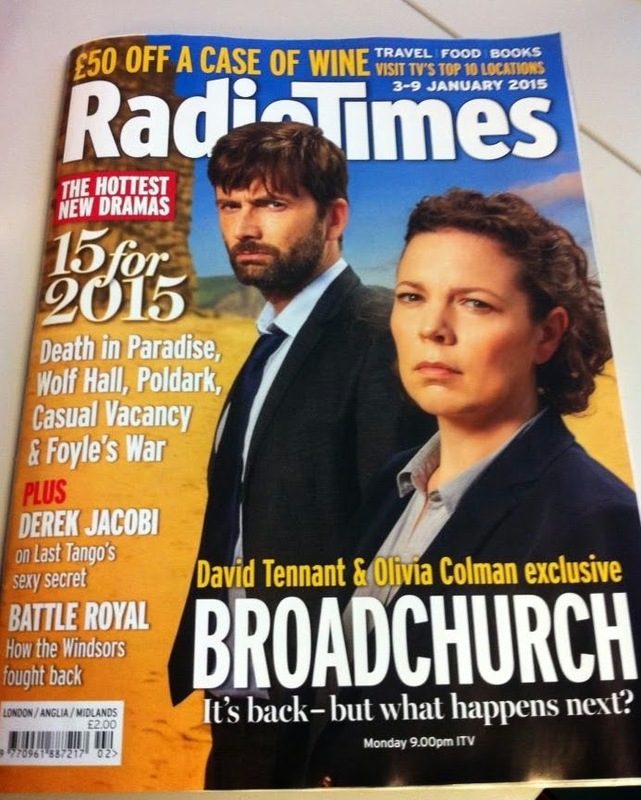 Scans of David Tennant and the Broadchurch cast interview in Radio Times. 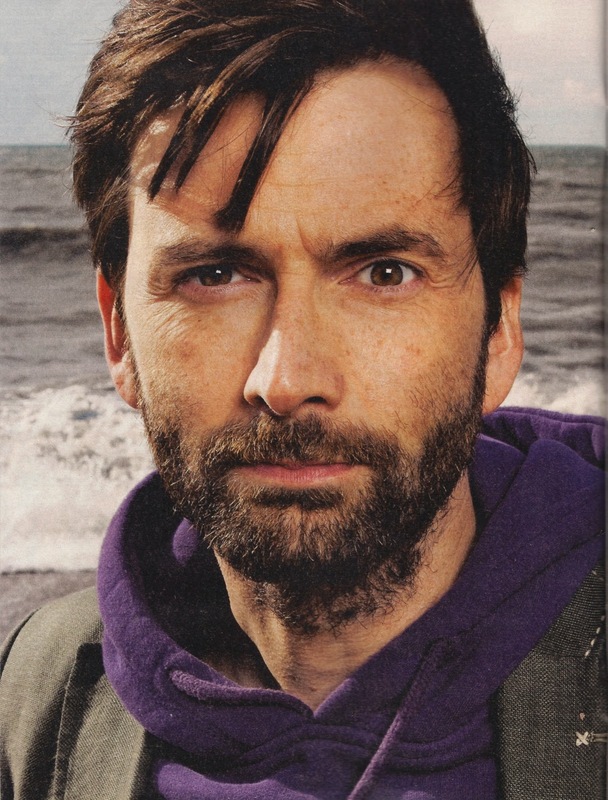 Dorset Echo has spoken briefly (briefly) to the Broadchurch cast (including David Tennant) about filming in Dorset. 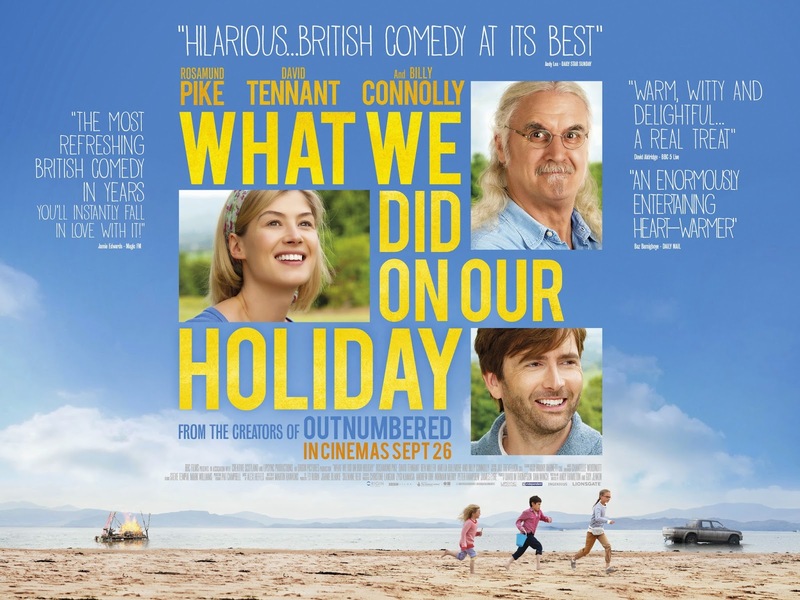 David Tennant has been shortlisted in the 15th Annual What's On Stage Awards for the Best Actor In A Play Award. David received his nomination for Richard II. What's On Stage Awards named nominations are announced at lunchtime today. This morning newspapers such as The Sun and The Mirror reported that Broadchurch Series Three had already been commissioned by ITV. Chris Chibnall has said at a couple of panels that he always had the idea for a three series arc. David Tennant has reached the final of Anglophenia's Anglo Fan Favorites poll. David beat Richard Armitage in the semi finals with 51.66% in a very close battle as they both took the lead several times. This afternoon David Tennant beat Tom Hiddleston in the third round of Anglophenia's Anglo Fan Favorites poll with just over 51%! Greenock Telegraph has an article about David Tennant's visit to Craigmarloch School on Monday. David Tennant, Doctor Who and Gracepoint have are been nominated in the shortlist for People's Choice Awards 2015. Round one of the Anglo Fan Favorites British Man Of 2014 Tournament by Anglophenia has started. Wendy Craig tells The Guardian that she admired David Tennant as an actor even when he was in The Rivals (back in 2000). 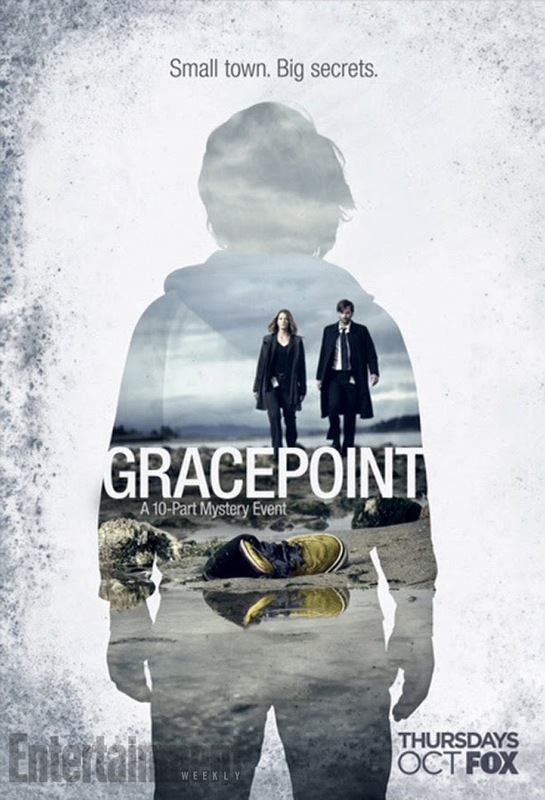 Monsters and Critics interviewed Alisen Down (who plays newspaper editor Kathy Eaton) about Gracepoint and her comments included "David Tennant is an amazing actor and so to feature him in both Broadchurch and Gracepoint was a stroke of genius in my opinion." SpoilerTV reports that episode 3 of Gracepoint in the US received 0.8 in the 18-49 overnights. WorldScreen reports that Olivia Colman has been nominated for an International Emmy for Best Actress for Broadchurch at MIPCOM. USA Today has a preview of episode 2 of Gracepoint with new quotes from David Tennant. "It's part of what makes this story so compelling, that this awful murder fractures the community. These people have been living so close to each other and yet have been keeping so many secrets from each other." Yahoo! 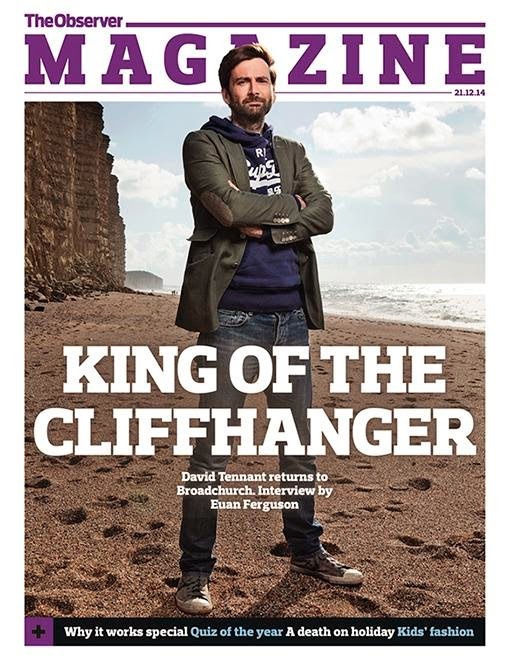 has an article titled 'Tennant awash with murder mystery' (about Broadchurch and Gracepoint). FormulaTV reports that Broadchurch received over 3.3 million viewers last night in Spain. A new interview (conducted at the TCA) with David Tennant about Gracepoint and Broadchurch has been posted to FamilyChoiceAwards. David Tennant / Doctor Who is the topic of The Guardian's Harry Venning cartoon today. Bristol Post interview with Joe Sims reveals that even the actors in Broadchurch Series Two don't know how it ends! Radio Times has an article titled 'Broadchurch writer Chris Chibnall: I cried at David Tennant and Olivia Colman's performances. There is a brief interview about Broadchurch Series Two with Chris Chibnall in the issue of Radio Times which is published today. As expected, Chris gives away absolutely nothing! David Tennant has won the Radio Times 2014 Television Champion poll. David Tennant won his semi-final of Radio Times TV Champion with 51.36% of the vote (beating Tom Hiddleston) today. David Tennant won his heat of the fifth round (the quarter finals) of Radio Times TV Champion with 78.6% of the vote (beating Karen Gillan) today. David Tennant won his heat of the fourth round of Radio Times TV Champion with 71% of the vote (beating Matthew Macfadyen) today. David Tennant won his heat of the third round of Radio Times TV Champion with 89% of the vote (beating Cillian Murphy) today. David Tennant won his heat of the second round of Radio Times TV Champion with 57% of the vote (beating Sarah Lancashire) today. 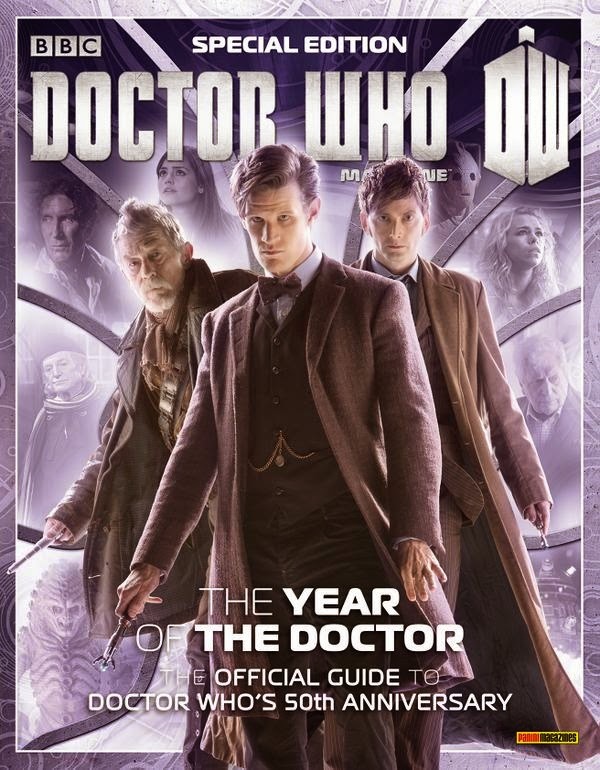 The BBC annual report shows that The Day Of The Doctor was the most viewed drama on BBC One in 2013 with an average audience of 12.8 million. MediaWeek has reported that Skoda will sponsor mystery drama on ITV (including Broadchurch Series Two). The Guardian has a different quote from David Tennant about the Scottish referendum. David Tennant has reached the final round of voting for Best Actor in the 2014 TV Choice poll. David has been nominated for his role in The Escape Artist. Arthur Darvill says filming on Broadchurch Series Two is "going really well" in an interview on The Iris.